^ Snyder, Benjamin E. R.; Bols, Max L.; Schoonheydt, Robert A.; Sels, Bert F.; Solomon, Edward I. (2017-12-19). "Iron and Copper Active Sites in Zeolites and Their Correlation to Metalloenzymes". Chemical Reviews. 118 (5): 2718–2768. doi:10.1021/acs.chemrev.7b00344. ISSN 0009-2665. PMID 29256242. ^ Reimann, Joachim; Jetten, Mike S.M. ; Keltjens, Jan T. (2015). "Chapter 7 Metal Enzymes in "Impossible" Microorganisms Catalyzing the Anaerobic Oxidation of Ammonium and Methane". In Peter M.H. Kroneck and Martha E. Sosa Torres. Sustaining Life on Planet Earth: Metalloenzymes Mastering Dioxygen and Other Chewy Gases. Metal Ions in Life Sciences. 15. Springer. pp. 257–313. doi:10.1007/978-3-319-12415-5_7. ISBN 978-3-319-12414-8. PMID 25707470. ^ "Lumber Company Locates Kilns at Landfill to Use Methane – Energy Manager Today". Energy Manager Today. Retrieved 2016-03-11. ^ Musk, Elon (2019-02-03). "Gaseous CH4/O2 & heavy duty spark plugs. Basically, a of insane power". @elonmusk. Retrieved 2019-02-12. ^ Sirohi, S. K.; Pandey, Neha; Singh, B.; Puniya, A. K. (2010-09-01). "Rumen methanogens: a review". Indian Journal of Microbiology. 50 (3): 253–262. doi:10.1007/s12088-010-0061-6. ISSN 0973-7715. PMC 3450062. PMID 23100838. ^ Goodland, Robert & Anhang, Jeff (November–December 2009). "Livestock and Climate Change" (PDF). Washington, D.C.: World Watch. ^ "New source of methane discovered in the Arctic Ocean". phys.org. May 1, 2015. Retrieved 2019-04-10. ^ "Frontiers 2018/19: Emerging Issues of Environmental Concern". UN Environment. Retrieved 2019-03-06. ^ Webster, Christopher R.; et al. (June 8, 2018). 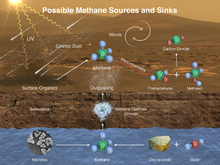 "Background levels of methane in Mars' atmosphere show strong seasonal variations". Science. 360 (6393): 1093–1096. doi:10.1126/science.aaaq0131 (inactive 2019-03-15). Retrieved June 8, 2018. ^ Eigenbrode, Jennifer L.; et al. (June 8, 2018). "Organic matter preserved in 3-billion-year-old mudstones at Gale crater, Mars". Science. 360 (6393): 1096–1101. doi:10.1126/science.aaas9185 (inactive 2019-03-15). Retrieved June 8, 2018. ^ Richardson, Derek (2016-09-27). "Elon Musk Shows Off Interplanetary Transport System". Spaceflight Insider. Retrieved 2016-10-03. ^ "Industries: Landfill-Biogas". Industrial Pollution Equipment Advisor. IPE Advisor. Retrieved 17 March 2019. ^ "Industries: Oil & Gas". Industrial Pollution Equipment Advisor. Retrieved 17 March 2019.